My to do list has hit overload. Our yard is a disaster. I am on duty to fix every Lego demolition and Troublesome Truck mishap for the foreseeable future. (Mothers of little boys will understand). Yet, on this Mother’s Day weekend, I feel compelled to take some time to express my gratitude for the greatest gift life has bestowed upon me. Yup. Motherhood. A gift, you say? Oh yes, indeed. With all the whining, crying, puking, and so on, I still, undoubtedly, LOVE, that I get to be O’s mom. I have said it before, but it bears repeating. This is the best job I have ever had. And to top it off, there is a day set on the calendar to celebrate it! To honor it! What? It’s like winning the lottery and then someone sets out a day to bring you another boatload of cash. I am sure there are some mommys out there thinking “Here she goes. Jacked out on Baby Magic again! Freaking Pollyanna Mommy!” Can’t help it though. I’m just super happy. I can’t help but wonder if I am happy BECAUSE I understand what a privilege it is to be a mother. It’s like the rules of gratitude and happiness. One really begets the other. What’s that facebook meme I often see on my feed? The happiest people are not the ones who have everything, but are the ones who believe they do. Motherhood seems to be a lot like that. I’m sure it isn’t about having a super awesome child, as we ALL do!! (Am I right?) I find it very hard to stay stuck in the “poop” of the day, so to speak, when it is so joyous being around my little guy. He’s hilarious. And sweet. And ingenious. And so fun to be around (99% of the time). I choose to deal with the 1% of bad and focus on the awesome rest. Truly, none of it is actually bad. That’s the wrong word. A more apt word would be difficult. But, anything worthwhile has its difficult moments. It’s funny, but motherhood is nothing like I thought. It is so so much better. To be a mother is the most rewarding job, the biggest challenge and the greatest joy of my life. It gives my life a meaning I didn’t know existed. I thank O everyday for choosing me to be his mother. 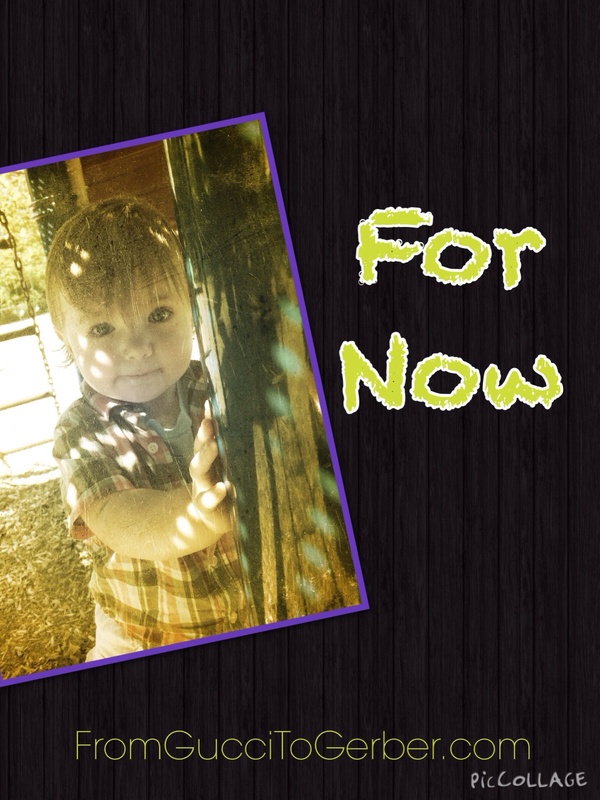 Maybe when he is older I will bring him breakfast in bed and get him a special gift on Mother’s Day…. Oh please! I’m not THAT cracked out on Baby Magic! I’ll let him think the day is about me. But I’ll always think to myself how lucky I am to be his Mommy. Always. 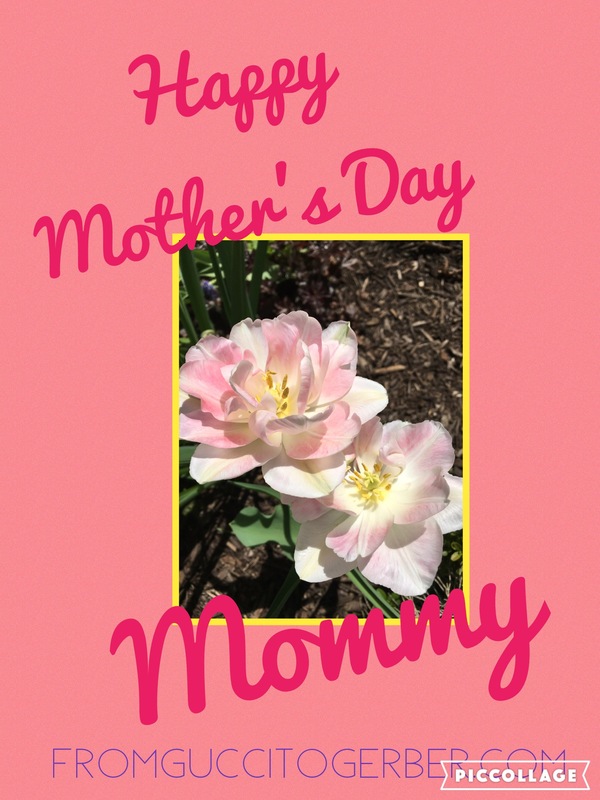 This entry was posted in Day to Day Survival and tagged Gratitude, happiness, mommy blog, Mother's Day, motherhood, toddler. St. Patrick’s day is this week, or as I like to call it, Irish Day. I call it that for no other reason than my brain can’t seem to remember St. Patrick’s name. Perhaps I shouldn’t be as lucky as I turned out to be? But if my research is right, the day isn’t just about the anniversary of the death of a Saint but about celebrating Ireland. Irish Day will do! If you are a regular reader of my blog, you know I count myself VERY fortunate in pretty much ALL areas of my life. I use such words as blessed, grateful and lucky with abandon. I’m like a broken record when it comes to Gratitude. But when I think about it, being grateful isn’t about having luck. Yet, I know that I am lucky to be grateful. Does that make sense? It’s like the chicken and the egg thing. Are you grateful because your life is full? Or is your life full because you are grateful? I hold firm in the belief that our perspective on our lives is everything. One woman’s bliss is another woman’s nightmare. And so it goes. It’s like when you read those affirmations on social media explaining life in 10 words or less. The secret to having it all is believing that you do. That one is my favorite. While I make fun of it being posted all over Pinterest, I actually believe the sentiment wholeheartedly. Someone might look at my life and think “Oh God! Who would want that?” But for me? It’s perfection. It’s funny, because this is coming from a girl who always looked over her shoulder, wondering if the grass was greener somewhere else. But now, while the reality of my actual lawn is bare patches and grubs, figuratively, it is the lushest lawn in the land. Instead of looking over my shoulder, these days I gaze in wonder at my amazing husband and our beautiful son and I thank my lucky stars. I know I have abundance in my life. And I know I don’t have certain challenges that many people face. But I certainly have a healthy share of challenges and road blocks in my life. The point is, everyone has their cross to bear. We all have something. Because that is Life. The good and the bad. It’s all about how we handle what we are given. How we react. In fact, our reactions are the only things we actually can control in our life. The choice is ours. The glass is either half full or half empty. I have spent my life around enough “half empty” people to know its not a path I’d like to follow. I prefer to believe my cup runneth over. I choose the wonder of rainbows and the possibility of pots of gold. I prefer to drink in and savor every moment with my husband and son. My life with them is a happiness I had only heard about until I was fortunate enough to experience it myself. So am I lucky? Aye…..I believe that I am. And that makes it so. This entry was posted in Wise Words? 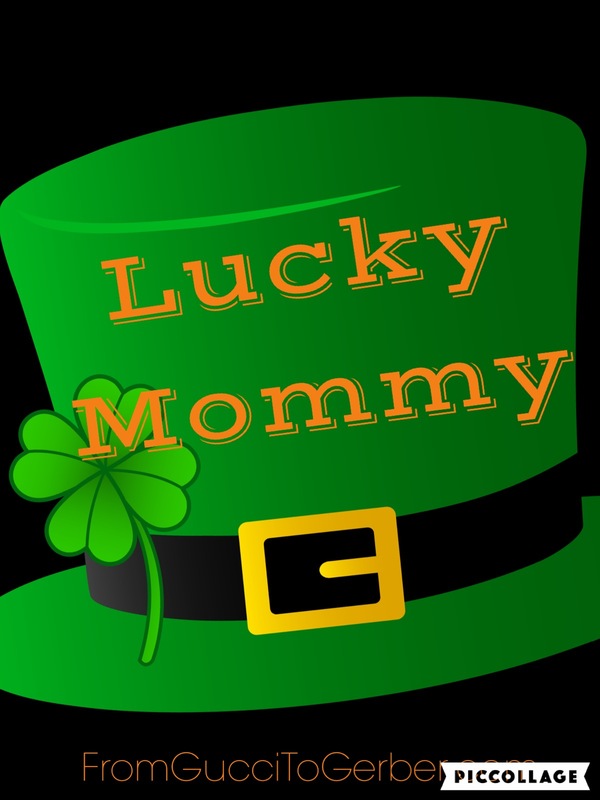 and tagged blessed, Gratitude, happiness, luck, lucky, mommy blog, parenting, Saint Patrick's Day. 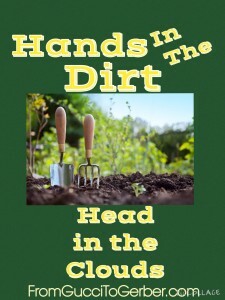 What is it about putting your hands in the soil that is so therapeutic? The smell of the soil. The tugging of the weeds. It is mesmerizing to me, much to my surprise. I find myself out in the gardens of our new home, several times a day. It seems the weeding is never done. There is always mulch to spread and new perennials popping up. I’ve even started composting! The grounds are like a big mystery to me. An exciting gratifying mystery. When we bought this house, I fell in love with the gardens. But I was also terrified of them. Up till now, I pretty much killed everything I ever tried to grow. I have hope for these gardens, though, because they were planted by someone else. Someone who had more than a clue about what they were doing. We had glorious mature perennials popping up through out the spring and summer….and I’m already seeing things coming up for autumn. It’s wonderful. My hope is that I don’t wreck it all. I am committed to at least trying to keep it beautiful. Let me be clear. I don’t have stress because I’m a Mother. I have stress because I’m a person. O does not give me stress. Taking care of him everyday does not give me stress. It’s exactly where I want to be. It brings me intense joy. My stress is about life stuff. I have a darling mother who’s dark dark depression and inability to “live” her life brings sadness to me everyday. I have two wonderful parents who’s marriage is so broken but neither have a clue how to fix it. It weighs on me. Senseless gun violence, hate crimes, bigotry, health issues…they can stress you out. And Donald Trump. He’s a huge source of my stress these days. Will I have to move to a different country if he is (God Forbid) elected president? But I have to tell you, when I am in the garden…I don’t think about any of that. I take O out with me most days for a bit of sunshine and exploration. He loves it! He is intrigued by the flowers and plants. And rocks! What is it with little boys and rocks? I let him wander within my eye’s peripheral. He is learning to separate and find distance from me with the safety net of seeing me across the yard. When he starts to get a little too far, I call him back and he toddles closer. It’s pretty awesome. It is exactly as I had imagined it in my mind’s eye….only better. It is our little Nirvana. Maybe it isn’t for everyone. I would have never imagined it was for me. I sooo didn’t see this coming. My idea of escape used to be a trip to TJ Maxx for a little bargain retail therapy. Maybe I got into this because it absolutely HAS to be done and calling a gardener isn’t on the table right now…?? I don’t know. All I know is that I am loving it. Getting dirty and all. This entry was posted in Day to Day Survival, Things I LOVE and tagged gardening, happiness, meditation, mommy, mommy blog, older mom, parenting, stress relief, toddler. Yesterday I opened up my Facebook feed and felt like I got punched in the gut. Not once, not twice, but three times. Within a span of four minutes, I was given three separate notices of horrible news. Two separate instances of friends finding out they have cancer and the other instance was about another special soul taken from this earth far too soon. Rarely do I get hit with three consecutive bits of bad news so quickly. It was a jolt, to say the least. I know bad things happen. It seems often that they happen to the best people. But why? And why one person and not another? Only a higher power knows these answers. It makes me think about life. And what it means to actually live. It makes me think about attitude, perspective and the choice we have everyday to LIVE. It makes me realize that life is for NOW. That is really all there is….NOW. Yesterday is done. Tomorrow may never happen. So NOW is everything. If you are lucky enough to be blessed today, why not acknowledge it? Why not celebrate? Why not thank your lucky stars? …Today! Tomorrow, I could be the one announcing some horrible news. I could be the one fighting cancer, God forbid. But today…I am healthy. I am loved. I am safe. I have joy in my life. I am living. Conversely, I know that if I am sad or in pain….it is just for now. It isn’t a permanent state of being. I was thinking that I hadn’t learned this lesson from my upbringing….as my wonderful Mother lives mostly in the past or in the land of “if only.” (If only her kids lived closer. If only her husband was different. Etc.). But, maybe that is precisely WHY I believe so differently about life. I see very closely what can happen when you don’t acknowledge what you have. When you don’t say out loud what you are grateful for…everyday. When you let the bad news of life dull your NOW. Trust me, I am not minimizing depression. I understand first hand the effects it has on the depressed and their loved ones. I have great compassion for anyone afflicted with this dark disease. I only hope, I can instill in my little O, a sense of gratitude and thankfulness. I believe you have to practice gratitude. Every night my husband and I list five things we are grateful for. It is a practice that has become habit and I love that. We will do the same with O when he is old enough. Hopefully he will carry that with him to help shape his perspective on life. I am not saying happiness is as easy as counting your blessings. But it is certainly a common practice of happy people. So for now, I am going to count mine. I have so many. My most precious one is toddling around, squealing with joy and clapping his hands. He is also in need of a diaper change. Now. This entry was posted in Wise Words? and tagged depression, Gratitude, happiness, mommy, mommy blog, motherhood, now.